Sabbaghian, E., Roodbari, F., Rafiei, A., Amani, J. (2014). In Silico Design of a Multimeric Polytope as a Highly Immunogenic DNA Vaccine Against Human Cytomegalovirus. Journal of Applied Biotechnology Reports, 1(4), 143-153. Elaheh Sabbaghian; Fatemeh Roodbari; Alireza Rafiei; Jafar Amani. "In Silico Design of a Multimeric Polytope as a Highly Immunogenic DNA Vaccine Against Human Cytomegalovirus". 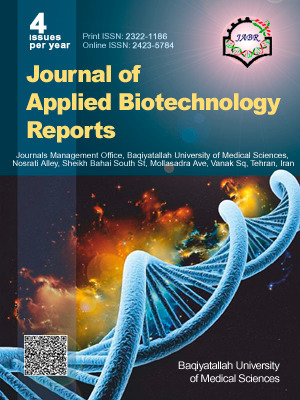 Journal of Applied Biotechnology Reports, 1, 4, 2014, 143-153. Sabbaghian, E., Roodbari, F., Rafiei, A., Amani, J. (2014). 'In Silico Design of a Multimeric Polytope as a Highly Immunogenic DNA Vaccine Against Human Cytomegalovirus', Journal of Applied Biotechnology Reports, 1(4), pp. 143-153. Sabbaghian, E., Roodbari, F., Rafiei, A., Amani, J. In Silico Design of a Multimeric Polytope as a Highly Immunogenic DNA Vaccine Against Human Cytomegalovirus. Journal of Applied Biotechnology Reports, 2014; 1(4): 143-153. Human cytomegalovirus is one of the most common pathogenic viruses all over the world. In congenital infection leads to neurologic severe disorders and even death of fetus and in individuals with immunosuppression may also cause severe clinical symptoms. Multiple evidence indicate that among several strategies, epitope-based vaccine (EVs) that can induce both humoral and cellular immunity responses, are the most important and have numerous potential profits. In this study, we select the viral surface glycoprotein B and phosphoprotein 65 and 150 with the highest antigenic and immunogenic properties, that have the most important role in induce cellular and humoral immune responses. Bioinformatics tools, as a standard and developed approaches use for epitope mapping. Epitope discovery greatly accelerate by in silico prediction methods with in vitro and in vivo verification. Bioinformatics methods and epitopes identification algorithms were used in order to selection of cytomegalovirus immunodominant epitopes, detection of each epitope antigenicity and design chimeric gene construct. The chimeric protein showed high antigenicity in vaxiJen analysis. Also further immunoinformatic analyses in order to predict the discontinuous and continuous B and T cell epitopes and MHC binding peptides affinity were used. The study results show that protein structures were suitable. Therefore it can be expected that construct is proper subject for practical experiments and stimulus for humoral and cellular immune responses.